Pickup trucks have a lot to offer owners in terms of overall flexibility of purpose, but there is a strong segment of buyers that don't need the extra weight and expense of a full-size model. 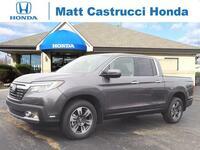 These are the people who would do well to consider the new Honda Ridgeline, available at Matt Castrucci Honda. 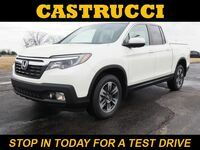 The Ridgeline offers plenty of capability and performance as well as a host of convenient features to make it a solid option in class that is getting more competitive with every passing model year. To illustrate just how different the Honda pickup is from the competition, Matt Castrucci Honda has done a head-to-head comparison of the 2018 Honda Ridgeline vs. 2018 Nissan Frontier. Without needing spoiler alerts, it's pretty safe to say that the 2018 Ridgeline has a bit more to offer on several fronts, especially at the base level. The most telling difference between the 2018 Honda Ridgeline and the 2018 Nissan Frontier is in how both trucks are constructed. Honda engineers used a unibody construction with the Ridgeline, whereas the Frontier uses a body-on-frame architecture. What does that mean? Basically, the choice of unibody construction means that the new Ridgeline will be lighter and nimbler than the aging Frontier. Drivers will notice the difference when driving the Honda pickup truck on the pavement, where most people spend most of their time. Additionally, the six available trim grades (RT, Sport, RTL, RTL-T, RTL-E and Black Edition) of the 2018 Ridgeline has more advanced technology to offer. All trims offer Bluetooth connectivity and access to at least one USB port. The RTL-T and above trims offer smartphone app integration, which is not available with the 2018 Ridgeline. 3.5-liter, V-6 Engine 2.5-L, 4-Cyl. All six trim grades of the 2018 Honda Ridgeline use the same powertrain setup. 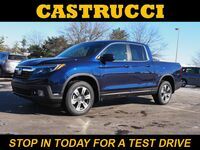 Under the hood of each model available at the Matt Castrucci Honda showroom is a naturally aspirated 3.5-liter, V-6 engine attached to a six-speed automatic transmission. Future owners can expect to be able to use up to 280 horsepower and 262 pound-feet of torque. When properly equipped, the 2018 Honda Ridgeline can comfortably tow up to 5,000 pounds. The base version of the 2018 Frontier tops out at 3,500 pounds. Finally, the cargo bed of the 2018 Honda Ridgeline is large enough to carry a full-size sheet of plywood between the wheel wells.